Yesterday morning my gorgeous, twenty-year-old brunette granddaughter, Jeannette, breezed by my desk complaining, “I have to sit today, and I really don’t feel like it.” “Oh, and I should go,” I added, “but I really don’t feel like it either.” We were both talking about the drawing session at Marin MOCA, the wonderful Museum of Contemporary Art we have right here in Hamilton. In spite of her resistance, Jeannette breezed by me at 9:30 a.m. asking, “Do I look all right?” as she rushed to her car on her way to model for the faithful group of artists who gather to draw, paint and sculpt on Tuesday mornings down at the Museum classroom. I am not far behind her. I am not going to miss this chance to get a three hour pose with my granddaughter. Our efforts are rewarded. 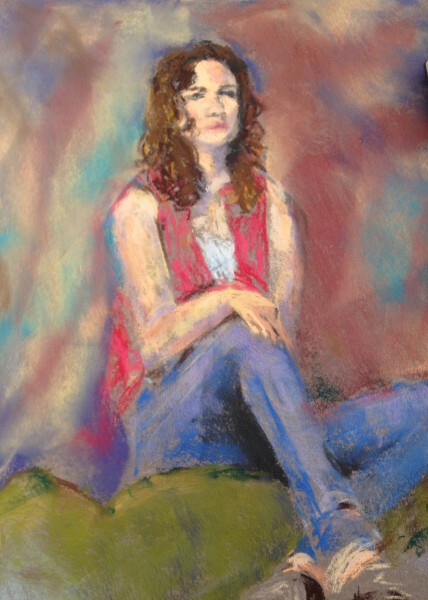 After three hours of dabbing, pushing and pulling pastels over my paper, a new Jeannette emerges. Not a copy of the original, but one who is mysterious revealing qualities not yet discovered in both of us. We are pleased and celebrate with a delectable lunch on the sunny deck of the Beso Bistro right next to the Museum. This Museum and the Art Studios it houses, are such a gift to the community of Novato, both to the artists and to the citizens. The Museum is open Wednesday through Sundays 11 to 4 p.m. and the artists of Novato Arts Center located there at 500, 501 Palm Drive &781 Hamilton Parkway, open their studios the First Sunday of Every Month from 11 to 4 pm.